Back in September 2009, I published Drobo Field Test - 18 Months Later. At that point, things were going along pretty good for me and my robotic backup device. Then, a couple weeks ago, I wanted to take advantage of one of Drobo's most touted features: increase its capacity by replacing a 500 GB hard drive with a 1 TB hard drive. I watched the video on the Drobo site about how easy this procedure was, then added a Hitachi 1 TB, 7200 rpm, SATA 3.0 drive in the bottom bay. For three days Drobo churned away incorporating the new drive into my array. At the end of the third day, it showed increased capacity on the Drobo Dashboard, but I continued to get a "data is at risk" message with orange and green blinking lights. I restarted everything, and still, the same situation. Then a new twist, Drobo would dismount itself thereby prompting a new error by my Snow Leopard Mac. Because Drobo can sometimes work things out for itself, I let it be for a couple days. But nothing improved. So I thought I would shut everything down, then put the original 500 GB drive back in the bottom bay, and at least get back to where I was before. Three more days passed. More grinding. And in the end, Drobo decided it didn't like that hard drive anymore either. So I swapped drives again, thinking that maybe this time it would accept the new 1 TB drive. Three more days passed. Nope. So, I shut down Drobo, removed the drive from the bottom bay, and restarted. Now that the bottom bay is empty, it seems much happier, except it tells me that it's full. And therefore my data is still at risk. So I'm going to offload 100 GBs or so to another hard drive, give Drobo a little breathing room, then figure out what to do. Bottom line: I haven't lost any data, so Drobo delivered on that promise. But, it seems like I no longer have an expandable drive either. This means that I'm less in love with Drobo than before. And it looks like I'm going to look for another backup solution. If you have comments or tips about this, please post here. I'd like to hear your thoughts. That's why I use Windows Home Server! I'd highly recommend calling tech. support. They were very helpful on several basic issues I had with my Drobo. Would NOT recommend going back and forth with old and new swap drives in Drobo based on how software works. Besides the Drobo issue, I hope everything is going great with you! I'm still very much in love with my Drobo and done a couple upgrades throughout its almost two years on my desktop. When you originally setup the Drobo, did you format for the total possible space (16TB I believe)? If not, the Drobo cannot expand without partitioning or reformatting (check with their tech support on this as I'm pulling from memory) beyond the initial format. Also, what's the current drive setup? I've found (and the Drobocalculator confirms - http://drobo.com/resources/drobocalculator.php) that certain upgrades don't actually expand the amount of space. For instance, if you have four 500 gb drives in a four bay Drobo, replacing a 500 with a 1TB (or 1.5 or 2.0TB) will not increase the amount of space available for data storage. My assumption is there isn't enough room on the remaining three 500 drives to handle duplicate data from the new 1TB. I had to replace two 500s with larger drives to get the addition space. You can use the calculator to see the different combinations. The address for the capacity calculator is http://www.drobo.com/resources/drobolator.php . It picked up the ) in the above post. I agree with Rob above that this may be what is happening with your Drobo. I have had mine for 1.5 yrs., and it has worked no matter what I threw at it. I have upgraded the capacity several times. I hope you get your Drobo back functioning the way it is supposed to. Thanks for your comments Rob, Steve, and Dudley. I totally get what you're saying about drive expansion going from one 500 GB drive to a 1 TB drive. Except... When I replaced a 500 GB drive with the 1 TB, Drobo has not operated correctly since. My concern isn't that I didn't get the expansion that I wanted. My concern is that it is now malfunctioning. If it had accepted the clean, brand new, 1 TB drive, then I could have replaced one of the other bays (they have 750 GB drives) with a larger drive to actually increase my storage capacity. So I do understand all of that. I will contact tech support also. But here's the rub there. My unit is out of warranty. It is over 2 years old, and I am not paying the $69 a year for DroboCare, which I think is too expensive. So we will see what type of support I get on a 2+ year old unit with no DroboCare. Two words for you: Netgear ReadyNAS. Totally flexible and rock solid. NAS and iSCSI plus great support and flawless X-RAID expansion. Never had a problem going on years now. I know all the TWIP/TWIT guys are drobo-fans, but you should check out the alternatives for your audience. You guys never talk about anything but drobo. I feel sorry for you and I'm slightly less in love too. I've a bit ahead of you in the size stakes. I recently had 3 of the 2TB drives, and a single 1TB. I replaced the 1 TB drive to a 2TB for the final expansion. I think it ground away for 5 days. It did finally come good though but I was nervous till it completed. I find them slow to access, especially with Aperture. Some might disagree, but I would say you can't run an Aperture library off a Drobo. Viewing full size and making edits is just too painful. I have to house the Aperture library on my iMac but need to keep the masters on the Drobo in a referenced kind of way. But that's a whole other discussion. You may need to think of the Drobocare expense in a similar vein to insurance. What value do you place on your data and your time? Just a thought. I was tempted to get a Drobo after hearing all the praising by photography podcasts, but when I looked at the reviews on Amazon, I was quickly dissuaded. The two killers were the slow speed and the proprietary software that can render you data useless and require drives be shipped to the company for data retrieval. I went with OWC's Guardian Maximus mirrored RAID system (http://eshop.macsales.com/shop/firewire/usb/raid_1/Gmax). For $399 I got 2TB x 2TB (and the enclosure and all cables) and with Firewire 800, I work Aperture files with no waiting. I realize that Drobo has greater capacity potential, but you can buy multiple Guardian Maximus products for the price of a single Drobo enclosure (before adding in the cost of the drives). And I understand that if a drive was to fail, I could easily access the surviving drive without concern of proprietary software interfering with my access to my files. Do read from the naysayers on Amazon- one podcaster responded to my concerns over these complaints that they were probably posted by competing backup technology companies, but when you read the posts they reflect legit concerns. I think the good that will come out of this situation (that I'm still in the middle of, btw), is that it will open up the conversation about alternatives. A few of you have already pointed this out. Drobo has hung on to my data. It's done its job in that area. So I don't want to talk it down. But if I can't expand it easily, then one of its advantages is negated, and the door is open for other systems. So, that's what I'm going to do, is explore. I'll keep reporting here. 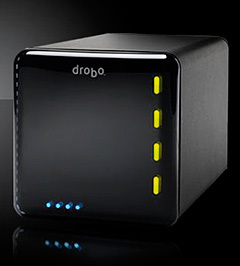 Drobo is just prettified RAID, and a well-marketed one at that. (Discounts and giveaways to tech podcaster for example.) I prefer simply to use SuperDuper! on my Mac to make multiple clones, one of which I keep offsite. If my boot drive goes down, the boot-clone gets me going in a matter of moments, and I don't lose time. I simply cannot imagine puting my trust into a device which gives no feedback as it churns endlessly for hours or days (as contacts and bloggers report) without knowing what's going on, and HOPING that it's merely one of those "sometimes" where it will "work things out for itself"
In my experience it's quicker to copy everything *off* a Drobo, add new drives to your Drobo unit, reformat the unit, and then copy everything *back* onto the Drobo than it is to wait days for your Drobo to finish copying data to your new drive. Drobos may be reliable, but they're not fast. I think what might be happening with it not saying you have enough size is that depending on the other drives in your system, adding a new drive adds expansion space, but not the actual space available. Something to do with the smallest possible drive in the array I think. Run the drobo calculator and put in 4x1T drives, then swap one out for a 2T and see how the available size doesn't change. Actually it doesn't change until you add two new larger drives (in that example anyway). This might be what you were running up against if I understand your issue. Derrick, any update about your drobo? Ia m asking because I am about to buy either a drobo or a Netgear ReadyNAS! "I simply cannot imagine puting my trust into a device which gives no feedback as it churns endlessly for hours or days (as contacts and bloggers report) without knowing what's going on, and HOPING that it's merely one of those "sometimes" where it will "work things out for itself"
I am going from 4 - 1TB drives to slowly adding 2TB drives (4 drive drobo), and my churning time is approximately 48 hours (with my system stuffed to *red alert!*). There is a progress bar and estimated time to completion for rebuilding within Drobo Dashboard under "Advanced Controls". Not sure how new this feature is, but it helped me calm down.